Washing Machine and Dishwasher – No Power! When your washing machine or dishwasher won’t turn on it can be due to a number of reasons. A loss of power can be due to a design or manufacturing fault, but it can also be caused by conditions or events beyond the manufacturers control. CAUTION: Electrical connections are a two way street, and before replacing a Main PCB the connected components need to be tested to ensure they aren’t the cause of a blown PCB. If you put a new PCB in a washing machine or dishwasher with a pump, motor or inlet valve fault you may blow your brand new PCB. Sometimes a blown PCB is the root cause of a no-power fault, but sometimes it’s collateral damage of another fault. As mentioned above a short circuit or partial short circuit in a dishwasher or washing machine component can cause the Main PCB to fail and the machine will no longer appear to have power. By use of the manufacturers service manual these components can be tested for the specified range of electrical resistance. Resistance is exactly what it sounds like. It restricts, or slows down, the flow of electrical current. When a short or partial short circuit occurs the current flowing through is greater than the PCB is designed to handle and the PCB can suffer a critical failure. The Display PCB can come as an integrated part of the Main PCB in your washing machine or dishwasher, or it may be a separate component. If the microswitch on the Display Board has failed then the appliance simply isn’t registering when you press the button. In most cases the microswitch can be tested from the back of the PCB, but some manufacturers, particularly washing machine manufacturers coat their PCBs in a gel resin to protect them from moisture, and cannot be tested with a meter. From experience, wiring faults causing power failure are more common in washing machines than dishwashers due to the effects of movement and vibration. It can be something as simple as poor quality cable ties with sharp edges that eat into the wiring over time until the wire is severed. Poor quality electrical connectors can burn or poorly fitted plugs can come loose. A wiring fault is uncommon, but it’s good if it’s the cause as it’s usually the cheapest repair if the fault can be found quickly. The two categories below account for the majority of non-manufacturer related issues of lost power in dishwashers and washing machines. If you take the preventative actions suggested you will significantly reduce the likelihood of appliance failure. 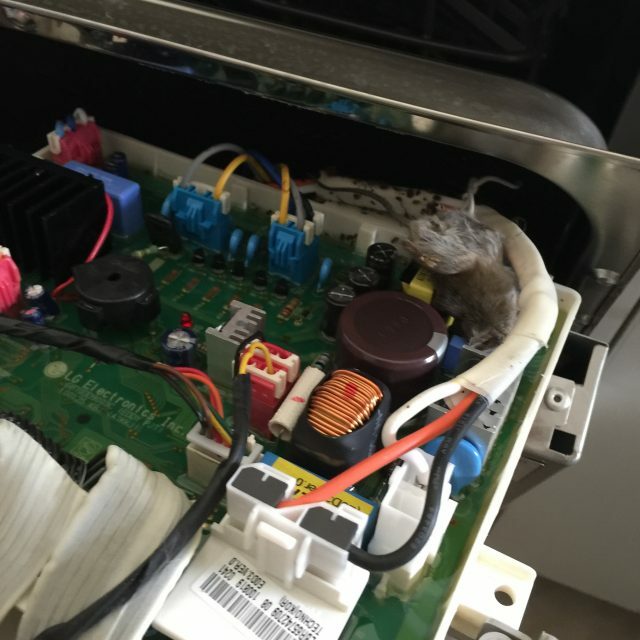 Below is an image of a dead mouse on a dishwasher circuit board. This image is shown to demonstrate the sizable creatures that can find their way into areas that appear inaccessible. The owner of this dishwasher kept a very clean house but lived near bush land in the Gold Coast hinterland. The largest problems, however, come from German cockroaches. They love warm, moist and dark areas so you may never even see them. Look for their tiny dropping underneath the door. Your dishwasher or washing machine circuit board is the perfect environment for them. Even if you don’t see bugs in your home it doesn’t mean they aren’t there. Regular pest control and cockroach baits under the dishwasher are your best defense. In Australia we officially use 240v, but there is no guarantee you have 240v to your home. Due to distance from supply infrastructure and variable load on the network, actual voltage can be anywhere from 220v to 256v. If your home experiences a power surge, and your normal voltage is in the 250v+ range, you can expect failure in electronic components. There is little you can do to reduce your voltage, but you can protect you electronic appliances with surge protectors. IMPORTANT NOTE: Surge protection and overload protection are not the same thing. Some powerboards have surge protectors in-built, but many only offer overload protection.